It seems like a little while since we heard anything about Windows Holographic, and that's not something that's going to change any time soon. Microsoft is not killing off the project (and HoloLens lives on), but has revealed that it is now going under a new, more descriptive name: Windows Mixed Reality. The company says that the change of name is a reflection of the fact that there is a broader vision for the platform. It also helps to convey the idea of virtual-reality-meets-augmented-reality that Windows Holographic/Windows Mixed Reality represents. 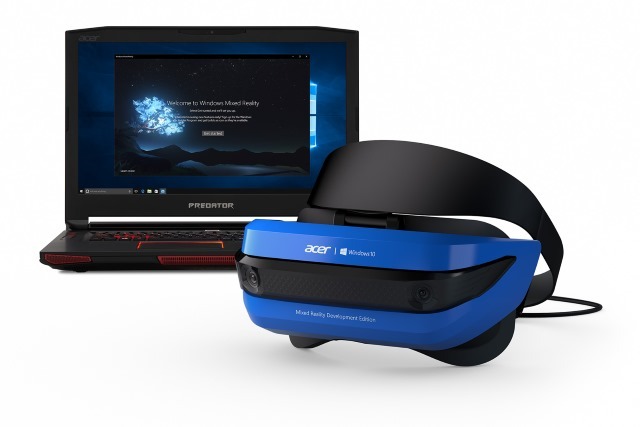 Microsoft also says that the Acer Windows Mixed Reality Development Edition headset is on the verge of shipping. The company is aiming to bring mixed reality into the mainstream, and has already revealed the entirely reasonable minimum specs needed to run a headset on a Windows 10 computer. Working with a range of partners, Microsoft says it is ready to deliver the "first mixed reality headsets to deliver built-in inside-out tracking" -- meaning everything necessary is built into the headset, and there's no need for external sensors. We're unifying the mixed reality ecosystem around a platform that enables shared experiences and interoperability between headsets. By opening up the Windows Mixed Reality platform to the industry at large, we anticipate the growth of holographic apps will make for stronger experiences and better devices for everyone.